« The Black Hole from CERN is now in Brasov! 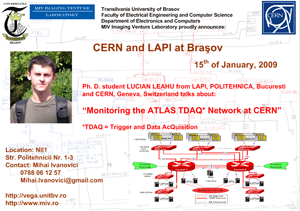 Ph.D. student Lucian Leahu from the Image Processing and Analysis Laboratory (LAPI) from POLITEHNICA Bucuresti, Romania and CERN (European Organization for Nuclear Research), Geneva, Switzerland is the invited speaker of our laboratory on 15th of January, 2009. 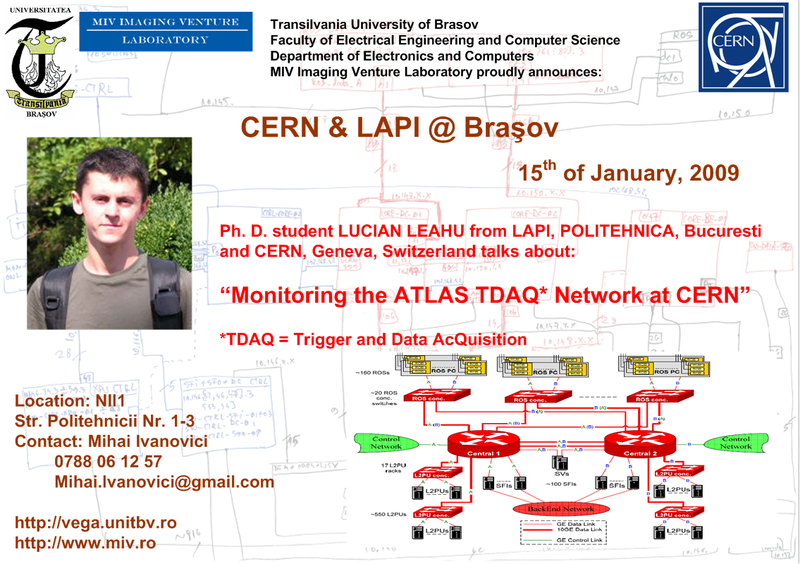 His presentation is entitled “Monitoring the ATLAS TDAQ Network at CERN”. The presentation is scheduled to begin at 15:15. Any modification will be announced on time! This entry was posted on Tuesday, January 13th, 2009 at 3:25 pm	and is filed under Events, News. You can follow any responses to this entry through the RSS 2.0 feed. You can leave a response, or trackback from your own site.